I think my body is going through a period of adjustment with this new schedule. I am getting hunger pains at different times than I used to, tired at different times, and am feeling generally more awake than I ever have before in the morning. My stomach has been hurting the last few days, and yesterday it hurt bad enough that I didn’t exercise. This year I’m going to focus on more cardio, walking, running, etc. and less strength training, so I’m going to try to pencil in a long power walk on this very cold day. 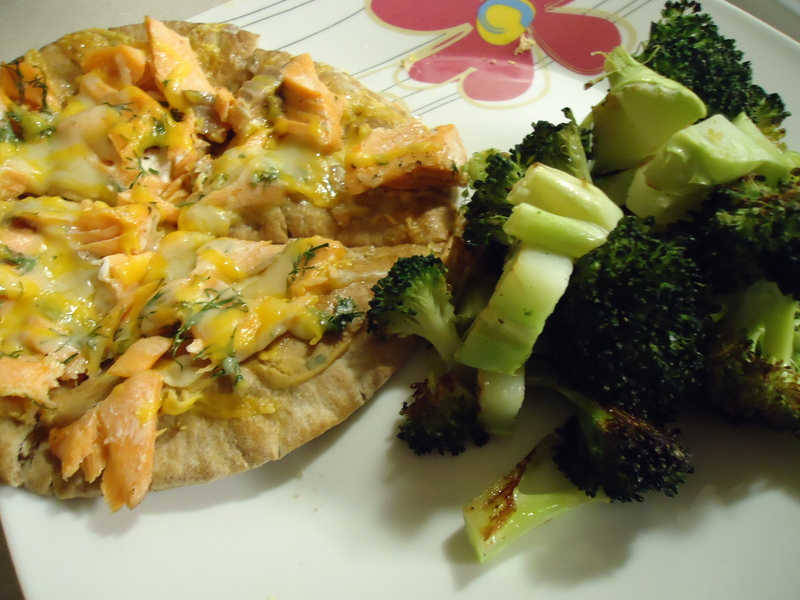 After I relaxed with a bath yesterday and started my new Kindle book The Casual Vacancy, I set to work on an easy dinner, breaking one of the food rules by mixing fish and cheese. I don’t care what people say…cheese goes with everything! This was actually quite a tasty pita pizza. I started with a whole wheat pita topped with the rest of my tarragon mustard. 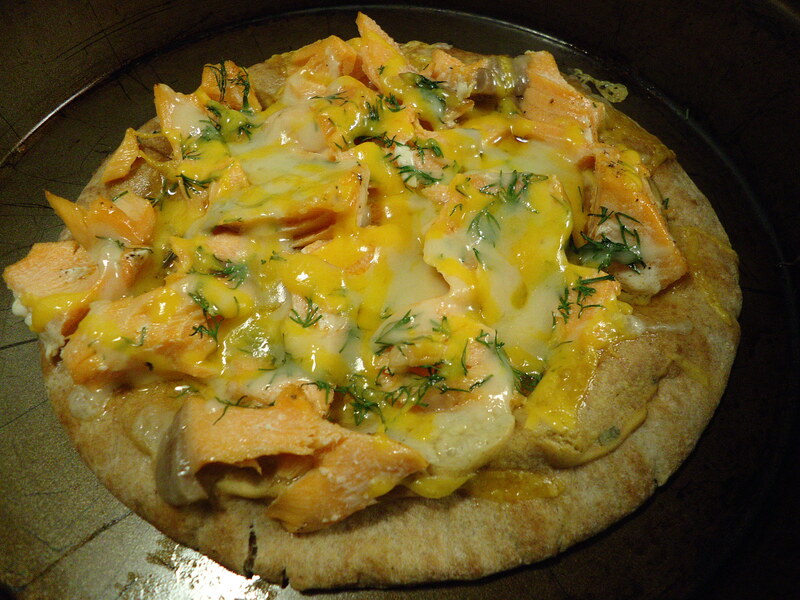 Then I added cooked salmon, swiss and cheddar cheeses, and a sprinkling of fresh chopped dill. Baked at 400 for seven minutes. It was weird…but in a very good way. Like Captain Picard singing his alphabet song. 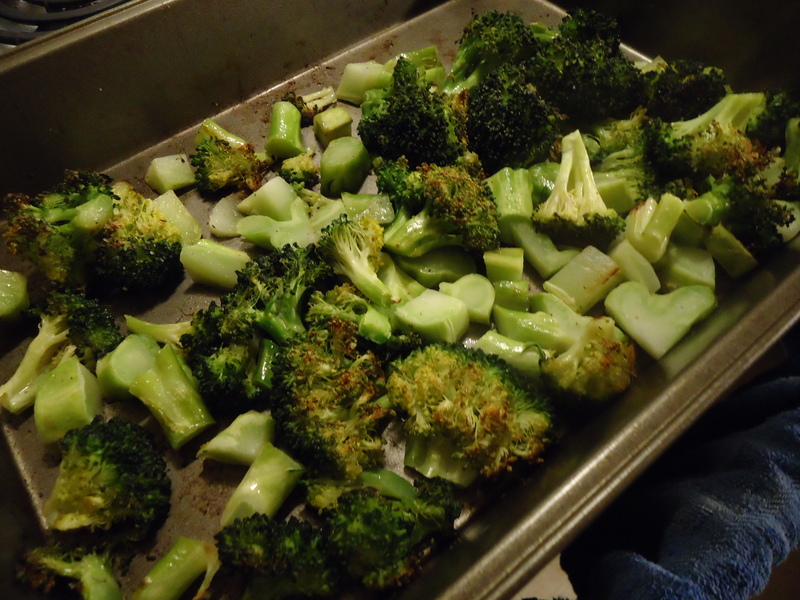 On the side, my vegetable love: roasted broccoli. Tossed in a bit of olive oil with garlic salt and pepper, roasted at 400 degrees for 25 minutes until the edges are crispy and golden. Perfection. Broccoli cures all. And there’s nothing wrong with breaking food rules once in awhile. This entry was posted in Dinner by designsondinner. Bookmark the permalink.